In December 2016, President Barack Obama designated a wide area of Utah known as Bears Ears as a national monument, writing, "Protection of the Bears Ears area will preserve its cultural, prehistoric, and historic legacy and maintain its diverse array of natural and scientific resources, ensuring that the prehistoric, historic, and scientific values of this area remain for the benefit of all Americans." Nearly a year later, in his quest to undo all things Obama, Donald Trump issued a proclamation drastically shrinking the size of Bears Ears, arguing that many of the treasures Obama identified "are not unique to the monument" and "are not of significant scientific or historic interest." When it comes to the area's prehistoric heritage, a definitive answer to this question appears to have been found. No big surprise: Obama was right all along. 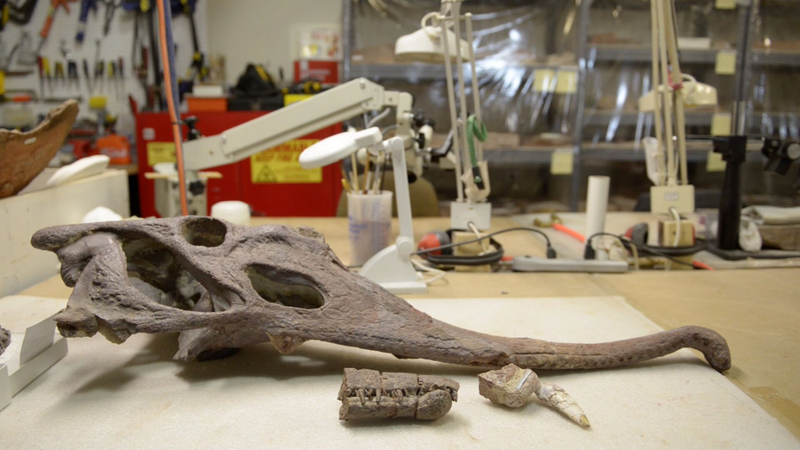 Paleontologist Rob Gay and his team of researchers recently unveiled a big public announcement regarding a cache of Triassic period fossils in Utah, including some substantive specimens of phytosaurs, which are crocodile-like dinosaurs. In 2017, the team started excavating the site, leading them to believe it may be "the densest area of Triassic period fossils in the nation, maybe the world," Gay explained in a press release. But now the site and the work is threatened. When the dig started, the site was within the boundaries of Bears Ears, as laid out by President Obama. Now the site falls well out of the much-shrunk boundaries Trump insists are "compatible with the proper care and management of the objects of historic or scientific interest to be protected." "By definition, it’s no longer the smallest area compatible with protection of objects, because paleontological resources are no longer protected by the monument," said Scott Miller of the Wilderness Society. His organization is supporting Gay's efforts to speak out about how Trump's boundary redefinition threatens his work. They're also part of a large scale effort from environmental, public interest and Native American groups to sue Trump, arguing that shrinking the federal monument size violated a law barring "arbitrary and capricious" revisions of previous federal agency decisions. “They’re running roughshod over what the public wants," said Laura Welp of Western Watersheds, which is also suing over Bears Ears. She noted that nearly 3 million comments were submitted to the Interior Department in 2017 in favor of protecting national monuments, but feels the energy companies that lobbied to shrink the monument had more leverage over the president. By redrawing the boundaries, Trump directly threatens Gay's ability to excavate this site properly. That's because his 2017 dig was funded by a government grant that was earmarked for research within the monument boundaries. “I can’t use this grant on this dig, because it’s just for Bears Ears National Monument, and now that the site is no longer Bears Ears. I can’t spend that money there," he explained. While it's illegal under current law for people without permits to take vertebrate fossils, Gay added, the lack of a monument designation means that there's little legal protection for the site as a whole. There's evidence of looting in the past, and some are afraid that people will steal more without facing legal consequences. Welp also noted that there's an enforcement issue, with monuments providing "another layer" of legal protection for the entire area — protection that can't be rescinded based on changes in management or philosophy at the Interior Department. "The important objects of scientific or historic interest can instead be protected by a smaller and more appropriate reservation," Trump's proclamation declared when he shrunk the size of Bears Ears by 85 percent. Trump's Interior Secretary, Ryan Zinke, defended Trump's decision by accusing Obama of using executive powers "to arbitrarily restrict the uses of hundreds of thousands of acres of land" and of having "abused the Antiquities Act to lock up vast swaths of public land." Miller argues, however, that the fossil discovery "demonstrates the care in designing the boundaries of the original monument" and that "President Obama knew that there were significant paleontological resources within the boundaries." The timeline matches with Miller's claim. Gay and his team received the grant in 2017 and were digging in the site months before Trump redrew the map, excluding the then-active excavation from the category of "important objects of scientific or historic interest." "The process in the Obama administration lasted for years," Miller explained, describing the lengthy period of research that went into creating the original Bears Ears designation. "President Trump, on the other hand, has a very closed process," he added, one that Zinke rushed through. Trump ordered the monument review in April, Zinke recommended the shrinkage in August, and Trump had it signed by December. The hasty process suggests that the Trump administration, despite all its claims to the contrary, simply doesn't value the protection of irreplaceable treasures such as the fossils that Gay has found. The fact that the administration simply cut Gay off from a grant that he had already received to dig there is further evidence of how little the administration actually cares about the land it's supposed to be managing.